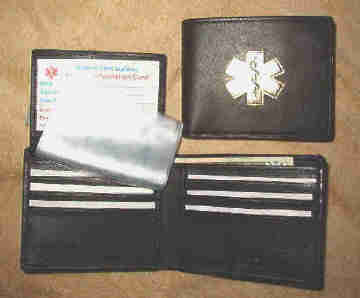 The Bi-fold flip up ID black leather Medical Wallet are hand crafted for Medical Alert Wallets only. This black bi-fold flip up ID Medical Wallet are made from genuine leather in black and dark brown. The Medical symbol is Gold colored Hot Stamped on the outside. Inside these Bi-fold flip up ID black leather Medical Wallets there are 6 clear credit card slots, 6 leather credit card slots, 2 pockets, one on each side under the leather slots, 2 full length currency holders, one has a suede backing, 1 hide a key holder and a Medical Information Card, for you to fill out. Shipping outside the United States and Canada require different shipping and handling charges, Please see Medical Alert Wallets policy and terms page for international shipping charges. You have a better chance of correct medical aid and early diagnose with the help of the Medical symbol and the health information on the Medical Information Card in your new Medical Wallet. 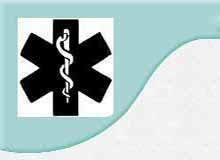 If you have any allergies, medical conditions and/or take medicines, especially to drugs, then you should have a Medical symbol on you somewhere and what a better way then on your wallet. In your wallet is the Medical Information Card which you filled out with your current medical information. So in case of an emergency or not, you'll be ready. "Copyright, Medical Alert Wallets, All Rights Reserved"